In the dimness of a foggy morning, a male flicker skulks in a patch of Iowa woods. Our favorite binocular for the serious beginner is the Eagle Optics Vortex Fury 8x32. It has excellent optics. It's smaller and lighter than most binoculars, but it has an extremely wide field of view. This book lets you identify all the birds in North America. Check off the woodpeckers as you find them outdoors. It's a new edition of Roger Peterson's great field guides, combining the birds of both eastern and western North America. If you're new to birding, get this book! 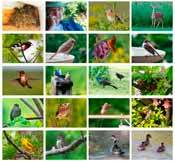 It has superb pictures, and the introduction shows you how to identify birds.